The latest bespoke application will allow training co-ordinators from Heathrow’s retail partners to access, book and manage the airport’s own training programme, known as the Retail Academy. 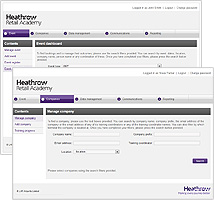 Each member of staff working with Heathrow's retail partners must undergo a one-day induction in order to understand and deliver its values, and Meantime’s software will automate and manage the booking procedure. The system will cater for high-volume traffic with tens of thousands of end users, all of whom will be able to access the system simultaneously. Lead developer Steve Parker says: "This system presents the type of unique challenge we thrive on at Meantime. It's time-sensitive and has multiple issues to resolve, so we’re keen to get our teeth into it and very pleased that the team at Heathrow has put its trust in Meantime once again." Heathrow’s Retail Academy manager Karima Sakhi says: "We've seen how successful Meantime’s software has been elsewhere within the group and we are confident they will deliver exactly what we need."